Make a grand entrance before you step onto the aisle by choosing one of these romantic horse and carriage rentals for weddings in New York. Find out all you need to know about reserving horse drawn carriages for weddings in New York. Make Your Fairy Tale Fantasies Come to Life! 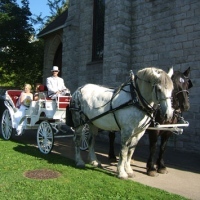 Housing some of the finest horse and carriages for weddings in New York, Andrusz Carriage Service offers rides in areas like Amherst, Clarence, East Aurora, Orchard Park, and Genesee County. The coachman and horse will be dressed appropriately to fit your occasion. Make your fairy tale fantasies come true, as you arrive you to your wedding and/or reception in one of the beautiful horse drawn carriages! During the winter months, Andrusz offers horse-drawn sleigh rides. Also available are horse-drawn wagon rides which are perfect for birthdays, anniversaries, Valentine's Day, and other such occasions. Safety is of the utmost importance, so all equipment is of the highest quality. Plus, all draft horses are extremely calm and gentle. Feel Like Royalty At Your Wedding! Make your wedding day a special moment for you and your partner. Ride a beautiful horse drawn carriage to your wedding where you can feel like you are in a fairy-tale. Have Loon Meadow Farm provide their horse carriage for your wedding, they will make sure that it will be a wonderful experience for you to enjoy. Loon Meadow Farm can provide white carriage horses and white carriages, making your wedding perfect and a spectacular event just like in the fairy tales. Loon Meadow Farm offers its services to the South-Eastern side of New York State. Make your reservations and have a horse drawn carriage at your perfect occasion. Make Your Wedding A Fairy-Tale Experience! Have the best wedding ever and ride a beautiful horse drawn carriage. 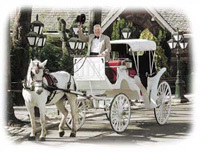 Let New York Carriage Company provide the best horse drawn carriage for your wedding day. They will make sure that it will fit perfectly to the theme of the occasion and will be elegant to look at. 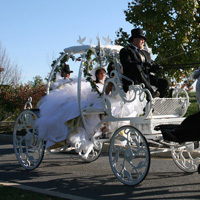 Book your reservations and have New York Carriage Company provide a spectacular horse drawn carriage for your wedding. You will definitely enjoy riding their carriage to your wedding. A Special Horse Drawn Carriage By Central Park Carriages! Make your wedding day special and ride in a charming and elegant horse drawn carriage where you can truly feel like a prince or a princess. 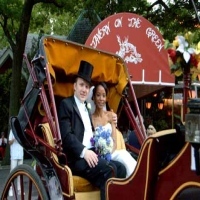 Have Central Park Carriages provide for your wedding a wonderful horse drawn carriage where it will truly make your wedding day a day to remember. Make your New York wedding special and have Central Park Carriages provide a wonderful horse drawn carriage. Call them or send them an email, they will be glad to accommodate to you on your needs. Make Your Dream Wedding Special! Ride in a horse drawn carriage for your wedding and make it a special occasion for you. Have Bee Tree Trail Carriage And Wagon Tours provide you the horse drawn carriage. They will offer you a beautiful and elegant horse drawn carriage perfect for a romantic wedding, making your wedding special and unique. 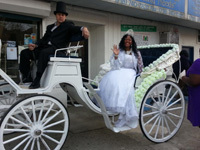 Bee Tree Trail Carriage And Wagon Tours provide their horse drawn carriage services to the Tri-state area of New York and the surrounding areas. Call Bee Tree Trail Carriage And Wagon Tours and make your reservations for their horse drawn carriage for your wedding. You will be sure that it will complement to the elegance and beauty of your wedding. A Wedding Filled With Wonders! Make your wedding a memorable and exciting event, ride a horse drawn carriage to your wedding venue. Travel in style with the horse carriage of Side Hill Farm, they will make sure that the carriage is elegantly decorated to fit perfectly well at your wedding. Serving the Eastern areas of New York State, Side Hill Farm is more than happy to accommodate you with your needs. Call Side Hill Farm or send them an email for their services in horse carriages. You will definitely love having a horse carriage on your wedding day. A Wonderful Ride To Your Wedding! Ride an elegant horse drawn carriage to your wedding venue and have yourself a wonderful time. Seaton Carriages and Horse Drawn Wagons provides an amazing wedding carriage that simply is beautiful and elegant. They will make sure that the carriage will complement the theme of the wedding by decorating it to be beautiful and classy. Serving the Tri-state areas of New York, Seaton Carriages and Horse Drawn Wagons can provide to you an excellent service in making your dream wedding a wonderful and a memorable occasion. A Spectacular Wedding Ride To Your Wedding! Enjoy traveling with class, elegance and style and ride a horse drawn carriage to your wedding. Ponies Will Travel can provide a wonderful wedding ride for your wedding. They can offer to you an elegant and classy horse carriage for your special occasion, making sure that you will enjoy and have a great time riding the carriage. Serving the areas of New York City and Long Island, Ponies Will Travel will make sure that their services will satisfy your needs. Call them today or visit their website, you will be sure that they will accommodate you in your needs. An Exquisite Ride With A Horse And A Carriage! Make Your Dream wedding even more special and have a great ride to your wedding venue with a horse drawn carriage provided by International Weddings & Carriage Rides. They will make sure that you will arrive with style and elegance on your wedding day, also they can provide a "Just Married" sign to be placed on the carriage upon request. Serving The Upstate areas of New York, International Weddings & Carriage Rides can make your wedding day even more special. Have a wonderful wedding where you can truly feel like royalty. Make your reservations and contact International Weddings & Carriage Rides, they will be more than happy to accommodate your needs. Have A Story Book Wedding In New York! Make your wedding day a wonderful event where you can feel very special on your wedding day. Have a horse drawn carriage for your grand entrance to your wedding venue where you can really feel great about yourself and have a great time. 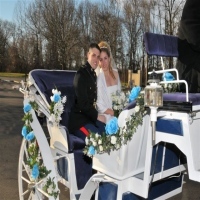 Regal Carriage Inc can provide to you an elegant wedding carriage for your special occasion, they will make sure that you will have a great time riding in the carriage. 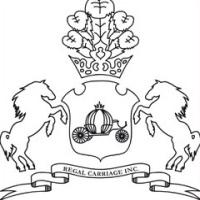 Book your reservations and have a horse drawn carriage on your wedding day provided by Regal Carriage Inc. Visit their website or contact them at their contact number, they will be glad to accommodate you with your wedding needs.